Click the button below to see each of the K9's and some information about each one! 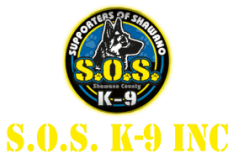 The Supporters of Shawano K9 group is a non-profit, community-run organization dedicated to the continued existence and advancement of the Shawano County Sheriff’s Department K9 Division. SOS K9 is always looking for new members and new ideas. Consider attending monthly meetings and make a difference in your community! Click the above links for Facebook or Email! This site is run by SOS K9 Inc, a non-profit organization. Copyright 2016. All photos are property of SOS K9.